Just finished two sets of seat belt covers. I’ve been meaning to make myself a new set. The impetus was a request from a friend who has a pacemaker and finds the seat belts in his car uncomfortable. I made him a set shortly after he’d had the pacemaker implanted. They’ve worn out. So I’d put a note on my calendar to make him a new set today. I made a set for myself as well. Materials for one seat belt cover: a piece of fabric 24″ x 7.5″, a double cut of batting 11″ x 6″, 1 piece of hooks velcro 3/8″ x 10.5″, one piece of loops velcro 3/8″ x 10.5″. Construction: I lay the batting in the middle of the fabric, fold down one long end over the batting, fold up the second long end to overlap the first (I try to use the selvage on one end – that means I don’t have to worry about folding under or fraying – if you don’t have a selvage, fold under the raw edge of the top fabric before stitching). Stitch close to the edge, then a second row of stitching 3/16″ away from the first. Next press the seat belt cover, turn in the side edges (folding in the end corners), press. Finally, careful lay one of the velcro pieces along the folded edge (over the folded-in fabric), stitch as close to the velcro edge as you can, then along the inner edge of the velcro. Add the second strip of velcro to the other side making sure both pieces of velcro are on the same side of the cover. Fold seat belt cover in half using velcro to close it. The cover will just slip over the seat belt – I use them with the folded edge to my neck, open/velcro edge away from me. They’re great for short people who find seat belts uncomfortable, particularly in the summer when I’m not wearing a heavy coat. I still use them during the winter as well. Just convenient to have them in the car. I also have one on the passenger side. They’re particularly useful for children using booster seats who also find seat belts cut their necks. My original pair came as a gift from Hawaii at least 30 years ago. I’ve continued making them as gifts and for myself ever since. The fabric doesn’t have to colourful, a closely woven batik works well – batik has quite a bit of body which makes the seat belt cover a bit stiffer and the fabric doesn’t wear as quickly as a softer cotton. I know, I said I was finished making bags but there was just one more I wanted to try – Lazy Girl’s Bendy Bag. I found images of it while looking for something to make for Hillary and played around with paper folding and almost got it figured out on my own – what I missed were the cut corners which you fold and seam straight across at the zipper tab end to get the blunt end at the front of the bag. I gave up, rather than mess around further and bought the instructions. I was right about how to get the diagonal seam and the zipper application. I had to try one this morning so I could put this bag making to rest! There I’m done (really). The last bag for a while. 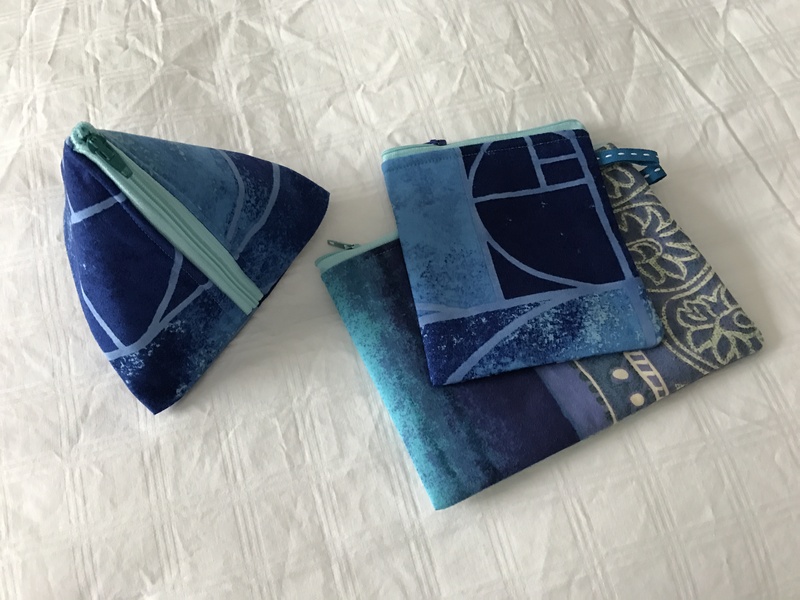 Now, I can see each triangular piece I cut from my rectangle on each side to get the diagonal seams on this bag are large enough to make a pod… I’ll save them for another time. Christmas Eve and all’s quiet here. No cooking or baking left to be done, no last minute present wrapping, none of the rush that most folks deal with on the night before Christmas. I thought this would be a good time to take a moment to send my best wishes for a relaxed and pleasant holiday season and all the best for a happy and healthy new year. That time of year again.Two days before Christmas – making the sweet kugel for Christmas dinner at Marlene’s. Can’t make just one, my sister Donna loves this kugel so one for her (for her freezer); and one for a friend also in time for Christmas dinner. I described in detail last year how I make it – Sweet Kugel – so I won’t go into the details again. If you want to learn how it’s done click on the link. 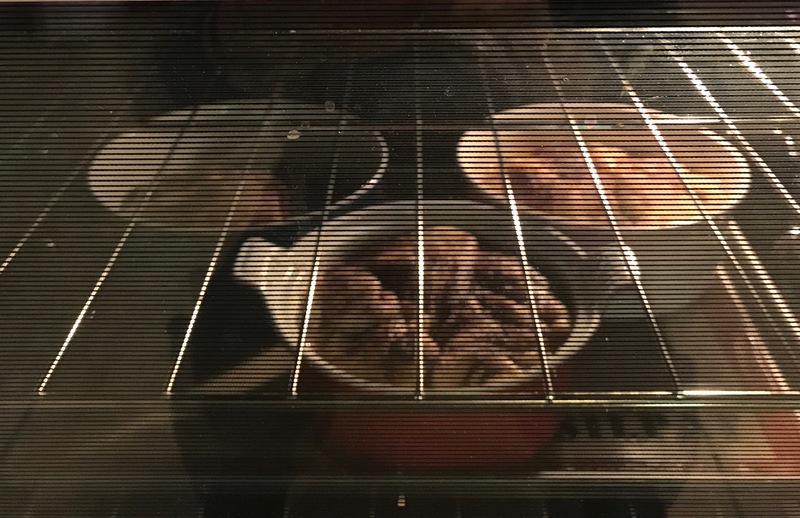 They’ve been in the oven about 20 minutes and already the apartment is smelling wonderful! 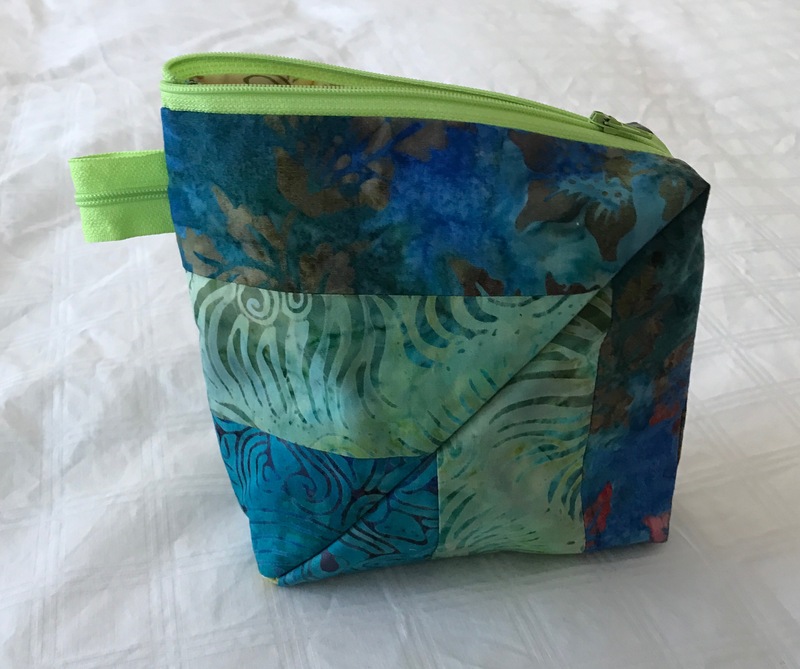 I was curious to see if I could apply the half-zipper technique to my standard zippered bag construction – that meant figuring out a way to have the seams concealed between outer layer and lining. Turns out to be quite easy. Instead of cutting two sides 6″ x 8″ I cut one piece 6″ x 16″ – I sewed the zipper to one long edge, added lining. Here’s the crucial difference – I didn’t top stitch the zipper, instead I steam pressed the zipper making sure both lining and outside were well pressed away from zipper edge. 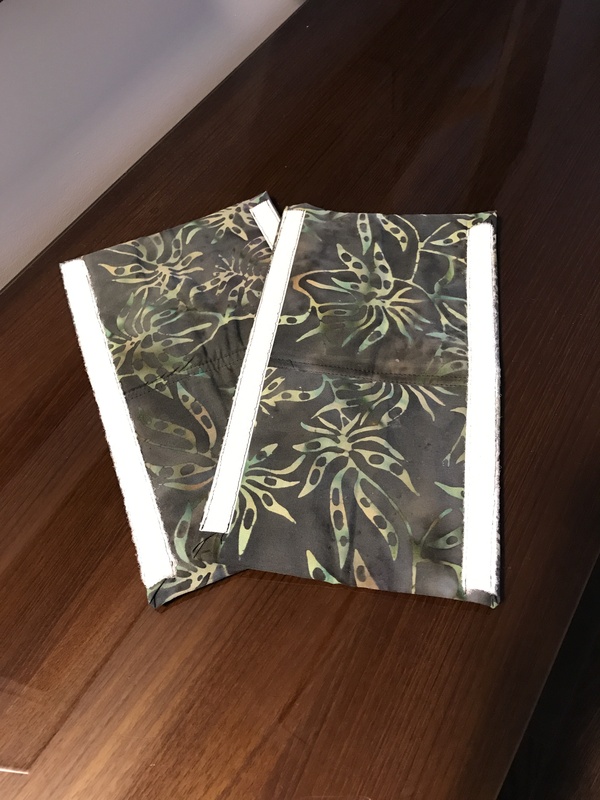 That allowed me to add the slide, fold the bag in half, separate the lining from the outside, sew the remaining side seam (from lining to outside with little tab inserted near the zipper) making sure zipper protruded on the lining side as I sewed. Next I made sure to open the zipper. Finally, I stitched the outside bottom, turned bag right side out pulling lining beyond the zipper, folded lining bottom seam allowance under and top stitched the lining bottom, pushed lining back inside bag, pressed. I had a zippered bag with a “loop” zipper, and concealed seams. 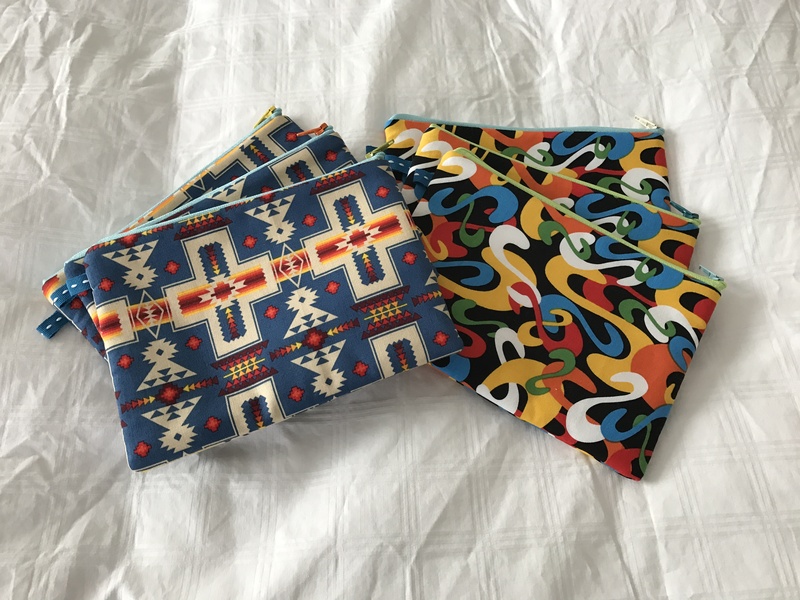 The fabric to make six 6″ x 8″ bags cost me $12; batting – I used large pieces leftover from a quilt (batting costs $26/m so say I used 1/16 m ) – $1.65, thread (can’t calculate), zipper (I buy zipper tape and slides from The Zipper Lady @ $36 for six yards (that includes exchange as well as shipping and handling), $10 for 40 slides (25¢/slide) – I get two bags from 1/2 yard so zipper costs me $10.50/six bags (a bit less than if I’d bought zippers individually at the fabric store). Total for the materials: $25.65 for six bags = $4.27/bag. Labour: It took me 2 hr to make six bags – time per bag, ~20 min (that’s pressing the fabric, cutting fabric and zippers, sewing it all together, pressing again). At $20/h labour works out to $6.65/bag. Total costs: $4.27 + $6.65 = $10.92. Profit – 20% of costs = $2.19. Total cost of one 6″ x 8″ bag: $13.12! People tell me I should sell them at the craft market – I’d be selling the bags at a loss if I charged $10/bag! So even a small zippered bag is a gift of love. That’s it for bag-making for now! 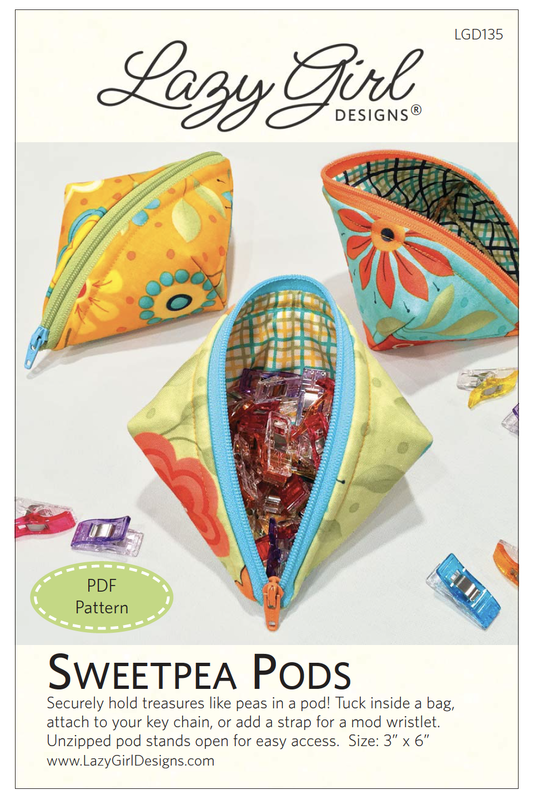 It’s not a big stretch from a “sweetpea pod” to a “pyramid pod” – the pyramid is based on a similar idea – instead of sewing the two side seams in the same direction as I would for a flat bag, you sew one side seam (closed zipper end) with the zipper in the middle and the second (the open end) with the zipper at one end. 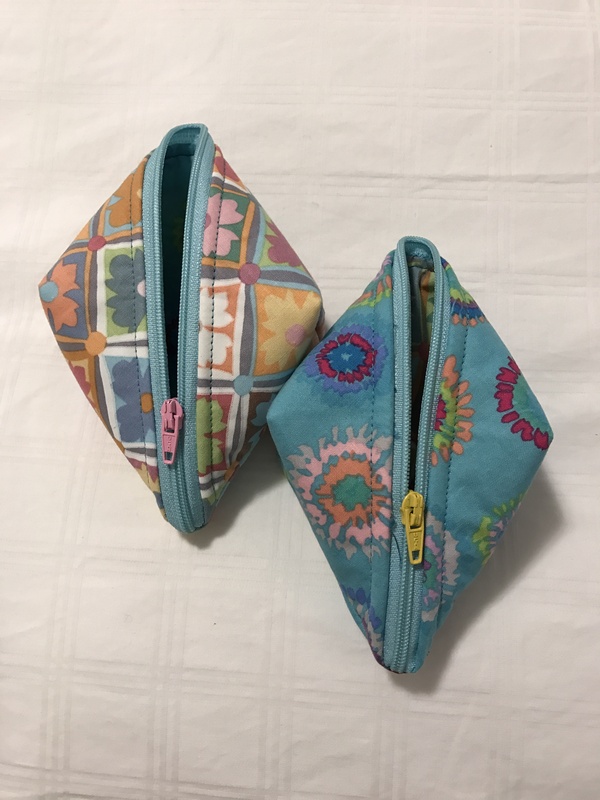 I made this pyramid pod (on the left) with a double zipper tape but I still have to experiment to figure out how to construct it with a single zipper tape (the way I did the sweetpea pods). The two bags on the right were sewn with a single zipper tape. To use this technique (with the zipper top stitched) I had to finished the seams within the bag, rather than concealed by the lining. However, if I don’t top stitch the zipper, it should be possible to make the bag with concealed seams – have to try that next. What caught my attention was the way the zipper was attached – a longish zipper is separated and one half is applied to the zipper edge and the slide is then attached to either end to create a zipper that closes from half of a zipper tape. Clever idea! Given I didn’t have time to puzzle out how the pods were constructed, I did something I rarely do – I actually bought the pattern at 7:00 am this morning, downloaded it, then proceeded to try making one. 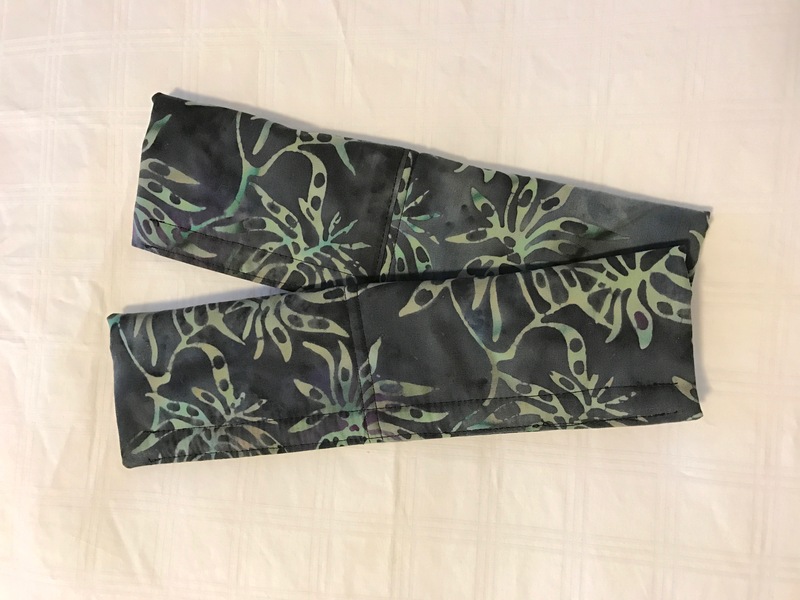 My first attempt was a disaster – in large part because I didn’t fuse the outer fabric to the batting – each time I tried sewing the side seams I kept missing the outer fabric on one side. My pod ended up lop sided and quite a bit smaller than intended. I persevered. My second pod at least looked somewhat like the pods in the pattern picture, but I still needed to refine my sewing. Pods 3 & 4, however, turned out just fine! Tomorrow I have to buy some velvet ribbon and hair elastics to put in the pods so I can wrap them as a gift. This zipper idea is one I need to try on one of my usual zippered bags – it could be a neat way of zipping them up!